You can use Quick Look to peek at the contents of files on your Mac — without having to launch the applications that created those files. Quick Look lets you look at a file as a pretty decent-sized thumbnail or even full-screen. And Quick Look might also be called Quick Listen because you can even play music. Indeed, the feature works with all sorts of files — PDFs, spreadsheets, Microsoft Word documents, movies, and more. That’s because Quick Look plug-ins for many other formats are available on the Internet. Highlight a file in Finder. Click the Quick Look button on the toolbar or press the spacebar on the keyboard. The file jumps out at you in a window. To display the file full screen, click the button in the figure that looks like two diagonal arrows pointing in opposite directions. 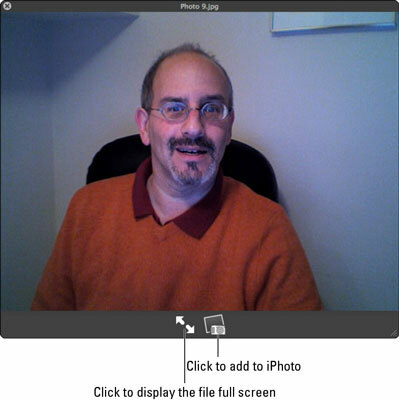 If you’re looking at a picture and want to add it to your iPhoto image library, click the iPhoto button. If you decide to open the file you’re previewing and the program that opens it, double-click the Quick Look preview window. To get out of Quick Look, click the x in the circle at the upper-left corner of the window or press the spacebar again. You can preview multiple images in Quick Look. Just highlight more than one file and press the Quick Look toolbar button or the spacebar. You can then use the forward or backward arrow to manually navigate through the files. Or press play to preview the files in a slideshow. Lastly, you can click the light table button to peek at documents in a grid.